Will Court Victory Stop Tweed's Relentless March to Close Schools? I received the news of last Friday's court ruling by judge Joan Lobis preventing the DOE from closing 19 schools, including Beach Channel HS, in an exuberant phone call from BCHS student leader Chris Petrillo. Skeptical of Joel Klein's adherence to the law, I asked Chris what would happen if the court decision is appealed or if Klein finds ways around the decision. "We will keep fighting," he answered. No sooner did we hang up than it was revealed that Klein would send out 85,000 acceptance letters to 8th graders, which were blocked by the court until the decision was rendered. Even if they chose the closing school that choice would not be listed but a note would be attached informing them they could revert to the closing school "if it remains open." The cries of outrage forced Klein to send out a modified version. BloomKlein are counting on a court reversal and will engage in dirty tricks even if they don't get it. Last year when they tried to close PS 241 in Harlem and PS 150 in Brownsville to make room for favored charter schools, the UFT sued and won on the grounds that the DOE was removing the only zoned schools in the neighborhoods. Klein attempted to undermine the schools by sending out a letter to parents asking why they would want to send their children to "failing" schools. Expect the same kinds of attacks on the schools even if they remain open for another year, which given the time frame seems inevitable. The question is how many 9th graders they will have and how deep the DOE will cut services to make sure these schools fail. And given the hostility to these schools by the people managing them, one would expect the parents of 8th graders to think twice about sending their kids to schools that are under assault. And that is where I have a problem with the UFT strategy. Sure, go ahead and sue, but let's not declare pyrrhic victories without a follow-up strategy. The suit did not oppose the concept of the DOE's closing of these schools but argued that Tweed violated the modified mayoral control law passed in August that put a few roadblocks (fairly minor) in the way of the juggernaut. Now BloomKlein have to provide educational impact statements that describe the effect on students and the surrounding schools. Naturally, in their arrogance, Tweed did a slapdash job. The NY Times reported that the Judge agreed with the plaintiffs’ contention that the department had issued boilerplate statements, which she found lacked “the detailed analysis that an impact statement mandates.” She found other procedural violations, including insufficient public notification before hearings. So, the next time they will just do it better. But close the schools they will. The root cause of the Tweed plan has not been addressed: the desire to close down public schools using whatever excuse they can find - and if they can't find any, they will squeeze their targets until there is a reason - to make room for semi-privatized charters. And the demand to fix schools they consider broken rather than close them. Let me go into some detail on what I mean by "fix" schools. 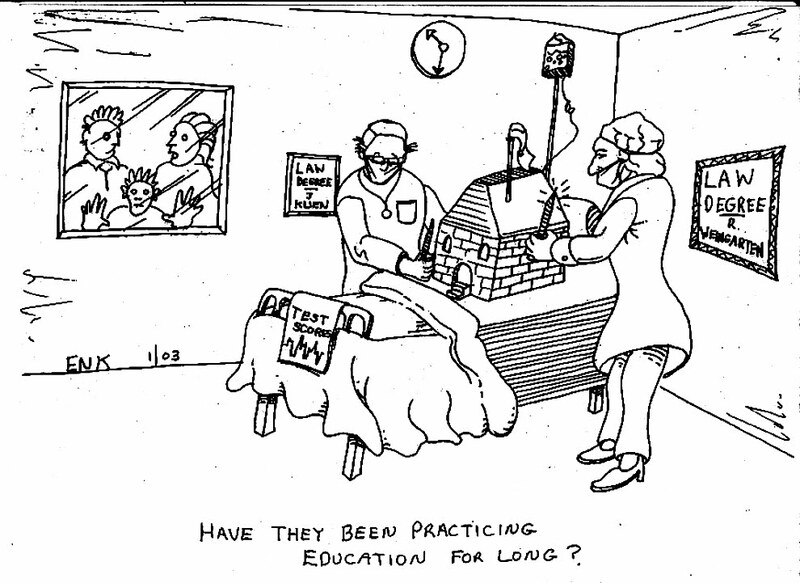 The ed deformers start out with the premise that the basic fault lies with the teachers. The only way around union seniority contracts is to close a school and reopen it with new (and cheaper) teachers. Oh, that we can go back to the days when I started teaching and took home $98 a week. Though they claim they want to pay teachers based on performance of students, BloomKlein's ultimate dream is to keep the bulk of teacher salaries low. Real education reformers believe that schools with students who are struggling can improve their prospects by adding the kinds of teaching and support services they need while finding a way to make teaching into a career with some guarantee of longevity with a decent salary. The problem with the limited UFT fight back is that it doesn't include a mass movement organizing people from the closing schools and teaming that movement with the charter school invasion of public schools. Pulling out people only at the January 26th PEP meeting (I'm betting that outpouring had an impact on the judge) was not enough. In addition, the DOE has targetted another 37 schools with closing - and bet that they will make sure to not violate procedures next time. People in the streets backing up a movement can effect court decisions. But the UFT just stopped mobilizing there and had zero presence at the February and March PEP meetings. Kudos to Channel View School for Research student Celine Anderson for standing up for her fellow students at Beach Channel in her excellent My Turn piece on the Beach Channel closing in the March 19 edition of the Wave where she castigated the DOE: The DOE does not listen to what we have to say, nor do they care; in their eyes they are right and we are wrong. Their minds are made up and it’s either their way or the highway. In other words, the academic future of millions of NYC kids is in the hands of a group of “adults” with the same maturity level, if not less, of a high school freshman. Celine has done a better job covering the story than most ed reporters at the major newspapers in NYC. Both Howard Schwach and I are admirers of educational historian Diane Ravitch, but from different angles. Howie wrote a strong column in The Rockaway Beat called "Diane Ravitch – My Education Hero" on Ravitch's new book, "The Death and Life of the Great American School System." In the book, Ravitch does a mea culpa about her getting sucked into the market based concepts of ed deform. Both Howie and I admire her for that. Howie likes her positions on standards and curriculum. Ravitch has been viewed as a conservative by the left, which has softened in recent years but has continued to criticize her for her call for national standards, which would only end up with some kind of test that people would be forced to teach too. Some charge that Ravitch doesn't tackle the bigger issues related to poverty that impact on schools. I'm holding my opinion in reserve until I finish the book. After I finish this column I am off to a Manhattan Institute luncheon at the Harvard Club featuring Ravitch and her book. This is conservative territory and when a leftie like me walks in alarms go off. Ravitch doesn't expect the friendliest reception at the MI since abandoning the free marketers and all they believe. My leftist friends have given me some questions to ask her. I'll wait until all the rolls are eaten to avoid a barrage. Here's a last reminder to vote in the UFT elections. Ballots must be in by April 6. If you like what I've had to say, consider voting for the ICE-TJC slate. As you enjoy your break consider finding that pink envelope the American Arbitration Association sent you. If you do, I recommend you vote for the ICE/TJC slate. (As a disclaimer, know that I am running for one of the at-large positions, my name is buried deep in there somewhere, but if you vote the slate it will count for me). 1. ICE/TJC are for democratic unionism. Unity is machine politics and back room deals with the mayor. Now that the mayor has spit in their faces they are in a state of shock. 2. ICE/TJC have a vision for democratic schools where teachers have rights as professionals. Unity believes in nothing other than more dues, double pensions for their staff and patronage jobs. 3. ICE/TJC are for digging in and preparing for confrontation. Unity has been the "if you can't beat 'em join'em" party. Randi was way too cozy with Bloomberg. Mulgrew is all chest-beating. HE HAS NO PLAN. Unity has painted us into a corner with one accommodating contract after another. We cannot postpone the day of reckoning, for every year we do our position only gets worse and worse. We need to call these so called ed reforms like Charter Schools and NCLB and Race to the Top for what they are: UNION BUSTING. And union busting is CLASS WARFARE. We must show other working New Yorkers that our fight is theirs. That, if they want a future for their children with rights on the job and a decent standard of living, the fight must start now. We are the standard bearers. If we collapse there will be no organized group out there to replace us. Voting for ICE/TJC is taking that first important step to moving forward. Klein appears ready to defy court order! What's Mulgrew's Next Step? The video on Fox News makes it sound like the battle won at least for next year and schools will remain open. The stories below, however, from GS and Brooklyn Eagle, sound like once again, Chancellor Klein is unchastened and is ready to take the law in his own hands; starting today and tomorrow, he will send out HS acceptance letters as though the court ruled in his favor, assigning not a single student to any of the closing schools. Instead, there will just be a note in the letters that students may later be able to switch later to these other schools, depending on the outcome of the case. Schools Chancellor Klein said in a statement late Friday, "Beginning tonight and continuing through the weekend, we will be sending out high school acceptance letters to students’ homes. We anticipate that by mid-week all students will have received their letters. 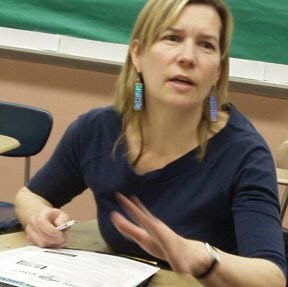 No students were initially matched to schools that were slated for phase-out," Klein said. "Depending on the outcome of the appeal of the judge’s decision, those schools might accept new students. As a result, students who applied to those schools will also receive a letter stating that, should the schools remain open, they may select one of them." Thus if this accurate it makes a fait accompli that the schools will be empty of students in the fall. Mulgrew says they will ask the court to bar this from happening. This is even worse than when Klein lost the lawsuit about closing the neighborhood zoned schools, without approval from the CECs, and subsequently sent letters to all the parents to take their kids out of these schools anyway. From Gotham Schools: What happens to the new schools that were supposed to open and replace the closing schools? City officials are confident they will still open. Fifteen new schools, including four new charter schools, were set to be co-located in buildings with schools that were going to be phased out. Department of Education officials said many of the buildings are already so underutilized that it is likely there will be room for the new schools to open in those buildings anyway. “We’re telling them that we’re evaluating, but we expect that there will be room for the new schools next year,” said DOE spokesman Danny Kanner. But that ignores the court decision that says these co-locations are illegal, since DOE violated the required process! The judge should call Klein in contempt of court, and throw the guy in jail! On many issues, one must legally first ask NYSED, or petition NYSED, to do something about the problem before one can litigate. Unfortunately, that's the way the public education system in NYS is set up and governed, or in this case, not governed. It's a procedural requirement - if you don't do it, you can be thrown out of court. Essentially, when you go to court, you're appealing a NYSED administrative decision. (And that's why NYC folks got screwed re class size reduction in the C4E process. NYSED probably told Klein to do whatever he wanted and to hell with the law.) Personally, I would never give NYSED authority to enforce any education-related law because enforcement will become a political decision, and NYSED virtually always decides things the wrong way. You can thank Shelly Silver for that, since he selects the Regents. While the NYS Comptroller audit didn't mention the NYCDOE, it establishes that NYSED has a pattern or practice of not enforcing its own regulations re p.e., and one could gather some information about the lack of p.e. in a sample of NYCDOE schools to show that while the audit didn't cover NYC, NYSED's pattern of nonenforcement is the same inside and outside of NYC - pervasive and statewide, including the NYCDOE. "An action against NYSED to enforce the regs in NYC ..." would involve something called a "writ of mandamus," which is a legal move to coerce/force a governmental entity into doing something it must, according to law or regulation, do ... but isn't. (Or something it is doing which it has no authority to do, in reverse.) Mandamus are not necessarily easy to get, but given the vast amt. of public health data showing the harm - palpable - to NYC's public ed. system's students, who need p.e. in order to avoid obesity, Type II diabetes, etc. - might not be so hard to get. Obviously, you all need to speak to practicing attorneys to see what the current law and precedents are, but it's certainly worth exploring in depth. And get a few public health goo-goos to sue as co-plaintiffs. NYSED has more complicated and bizarre regulations than you can shake a stick at, and the NY Education Law is similarly incredibly (and often uselessly) detailed. Some review of the entire set of regs. and laws, including for ELLs and special ed. kids, should be made and a Baker's Dozen of biggies which the NYCDOE is violating, at least in part because of miseries inflicted by co-location and school closings, should be developed. And then, after asking NYSED nicely to enforce ... these kinds of actions can be brought to bring both NYSED and the NYCDOE to heel. F'rinstance, the NYCDOE's credit recovery scams - I've looked long and hard and prior to Oct. '09, it was illegal, and NYSED had no authority to approve the NYCDOE allowing this anywhere, any time, and ... to have done anything about this after the regs were passed would hurt kids who were inappropriately given diplomas because they were given (notice I didn't say "earned") these credits. It could have been stopped flat, bigtime prior to passage of those regs. Both NYSED and the NYCDOE typically do whatever the heck they want because the laws and regs are so intentionally over-complicated that it's almost impossible for anyone to understand all of what they require. Nevertheless, a targeted review of the laws and regs. can provide potent weapons to bring both NYSED and the NYCDOE to heel - almost on a daily basis. The underlying problem, which you're all dealing with, is that the system of governance for NYSED, and thus the entire NYS public education system, is appallingly corrupt. It needs to be revised and, frankly, reamed out. For starters, we need a truly independent Inspector General with a big budget and subpoena authority to review everything NYSED does, from school corruption to regulation of the NYCDOE's co-location program. Right now, there is actually no entity in NYS which has this authority - the system is governed in the dark, behind closed doors, and often from under some rock. We need an independent, powerful IG with authority to bring in some transparency, and then we can see what else is needed to get genuine accountability. The fish rots from the head and the head in NYS is NYSED. No, this is not about the UFT election campaign being over. I'll post about that later. My marathon of reading all 4 novels in John Updike's Rabbit Angstrom series has ended. It's been a year, or more, since I decided to read the entire series when Updike died last year and once I got ahold of it I was like a dog with a bone. I stuck with it despite there was no character I really liked. But I couldn't let go. One woman told me recently she never read Updike because of his attitudes towards women. Once you start following the arc of someone's entire life it isn't easy to stop. Starting in 1959 and ending in 1990, each book covered a decade, with lots of backtracking. Lots of stream of consciousness. Deep descriptions of characters and scenery and politics and sports. I'm far from a literary critic so I won't go further. 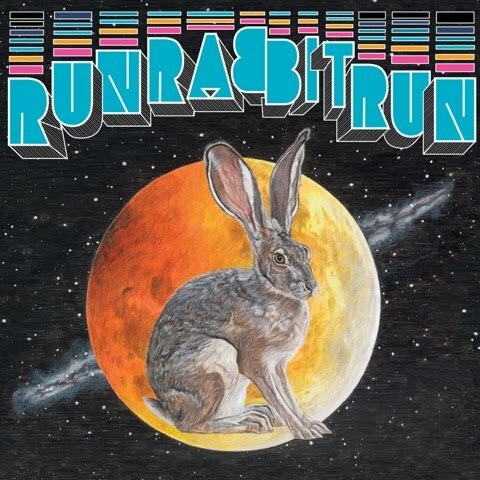 I didn't love it but Rabbit, it was nice knowing you. Sorry there wasn't a 5th novel to take us into the 21st century. I guess Updike got tired of Rabbit and his world too. The DOE is successfully implementing the Grover Norquist “Starve the Beast” policy and it must be stopped. Norquist recommends tax cuts and more tax cuts so that government won’t be able to function and then his people complain that the government is doing a terrible job and needs to be cut some more." I find the NAC attack on ICE over the silly notion that presenting resolutions at UFT Executive Board meetings is the most important thing one can do extremely funny. Especially since that is all New Action does. ICE, you see, has been out there actually supporting people at closing schools over the years. Today's court decision on the closing schools is a perfect example of how UFT resolutions mean little. There have been quite a few resos against closing schools over the years. Why did it take so long to go to court? As I read it, the complaint is over the way procedures were not followed. Tweed's arrogance ha been exposed. But expect them to do it more carefully next time. The UFT doesn't oppose the closing of schools - as long as the procedures are followed. But a good aspect it that Tweed will have to come up with some consistent "facts"- twisted of course - for why schools should be closed. Like, Eva needs more space. While New Action makes empty resolutions in a sea of Unity clones, ICE people have been at closing school meetings and PEP meetings and charter invasion hearings speaking up in support. Not that ICE never made a closing school reso when we were on the Executive Board. James Eterno reminded me today about this post on the ICE blog on Jan. 13, 2007 by Jeff Kaufman, currently ICE-TJC candidate for Assistant Treasurer. It exhibits the kind of work ICE did on the Exec. Board, with analysis of DOE policy behind school closings. James Eterno, ICE's High School Rep, submitted a resolution calling for the UFT to get off the fence and call for a moratorium on the closing of schools before an independent evaluation can be concluded. While hundreds of our members face excessing Weingarten showed how she can fiddle while Rome burns and substituted a watered down resolution which called for the DOE to "refrain" from closing schools. Thanks, Randi. 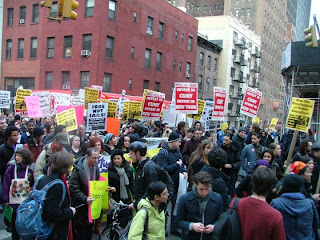 Way to stand up to BloomKlein who close schools for political reasons and to create large pools of excessed teachers. But what could we really expect, especially when you completed a sweetheart deal to continue the decimation of seniority, loss of grievance rights and other basic rights of our members? You showed your true colors when you "agreed" with the closing of Lafayette. The teachers and staff at Lafayette thank you as well. RESOLVED, that the UFT use part of its “Teachers Make a Difference” campaign to publicize the need for full funding of all schools, with particular attention paid to calling for extra funding for troubled schools in order to: lower class sizes, provide modern up to date facilities as well as safe and stable environments as an alternative to closing schools, displacing students and staff resulting in overcrowding of neighboring schools. It’s time for the UFT to use its resources to stop allowing the Department of Education to get away with holding teachers and students accountable for their mismanagement. The DOE is successfully implementing the Grover Norquist “Starve the Beast” policy and it must be stopped. Norquist recommends tax cuts and more tax cuts so that government won’t be able to function and then his people complain that the government is doing a terrible job and needs to be cut some more. The DOE chronically under-funds schools. The courts have declared that the city doesn’t even give adequate funding for a sound basic education. The DOE adds to the problem by chronically mismanaging schools and then blaming us when schools don’t get everyone to be proficient. The UFT’s position on all of this has been to wait. In 2003 the Manhattan High School Chapter leaders came up with a resolution calling for a moratorium on the breakup and redesign of large high schools. 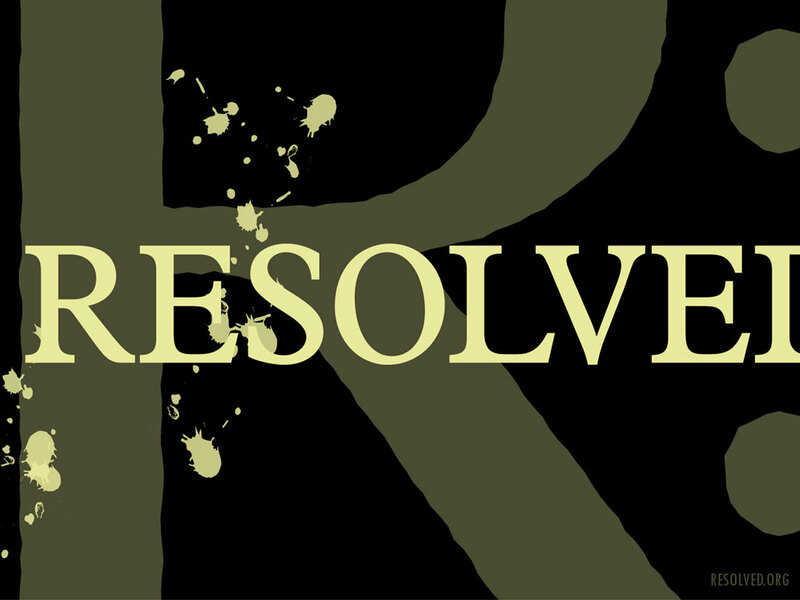 I cosponsored the introduction of that resolution in this body and it was tabled. The UFT put together a small schools task force that called for among other things a study to be done on the effectiveness of small schools but it didn’t call for the DOE to stop closing schools until we have the data. In 2006 the Parents Citywide Council on High Schools called the Chancellor to substantially delay the implementation of small high schools in part because of the issue of special ed and ESL students not being accepted in new schools. I asked last year at this body if the UFT supported that resolution and I was sent a copy of the small schools task force and later the UFT sponsored a resolution reaffirming the value of large high schools but not calling for the DOE to stop closing schools. Now we need to go further. When the DOE brings in an outside agency to review schools and they find Tilden High School is proficient and then soon thereafter it is announced that Tilden will be closing, there is something that doesn’t smell right. Small schools versus big schools is not the issue. The issue is what constitutes a failing school? It’s not only large high schools that are in danger. Schools that have already been redesigned are in trouble. Many of us are being threatened with being closed because we exercise our contractual rights. I have been told that I better tone it down or Klein will come in and shut us down. What this resolution asks is for the DOE to stop shutting down schools until we can get some fair, independent studies done to assess the effectiveness of newly redesigned schools including examining the impact on neighboring schools. This resolution also asks for the UFT to publicize the need for fully funding all schools but particularly schools that are in trouble so we get what we need to succeed and stop the madness of closing schools, displacing students and staff and then overcrowding other schools where they then are deemed as failing. That cycle must end now. This is a powerful resolution, with an analysis of the motives behind school closings 3 years before the UFT woke up. And we're still not sure they have. Of course, Unity and New Action ignored what we were saying. If there is a point to making these resos, it is to use them to educate people on the issues. Without putting this up on the ICE blog, the reso is meaningless, since Unity waters them down or rejects them. A fundamental difference between New Action and ICE is that we believe the UFT/Unity machine has to be beat over the head to move, not have a nice chat with them over policy. When we have an army of thousands at our backs we will be able to force change. Otherwise, we are talking into space. I'm cross-posting this from NYC Educator. I had a conversation the other day with Anna Philips who wrote the piece. I'm giving her the benefit of the doubt as this is part of a series. But it is troubling to have her say that the UFT is in trouble of the opposition vote rises when the exact opposite is true. A rising tide will lift the UFT boat, not sink it. This piece could well have been written by the Unity propaganda team, already up to its elbows in cutesy and blatantly unfair manipulation---and this on the even of the election. ICE/ TJC presidential candidate James Eterno just commented here that today is the very last day to persuade people, and the preposterous contention masquerading as news at Gotham is neither welcome, accurate, nor helpful. The mayoral bloc + Staten Island had nine members so they swept all the votes easily. All about grad rates. I asked about abuse of credit recovery, discharge rates, cheating/regrading on Regents. Chancellor dismissed all these concerns, said they'd be happy to disclose whatever data is relevant but said they don't can't measure the extent to which credit recovery is used. Anna Santos from the Bronx was in a car accident and could not attend. She is doing fine. A large contingent of people from the University Heights School community protested the move of their school off the Bronx Community College campus and the failure of DOE to find them suitable space nearby. In Anna's absence, I read a statement on her behalf stating opposition to the move of University Heights HS and closure of the construction trades program at Alfred Smith HS. Washington Irving HS community protested the siting of another school in their building which will curtail their growth and recovery. Goldie Maple Academy community opposed the insertion of a new charter school in their building. In a very moving public comment, the daughter of Goldie Maple explained how she had been asked to come defend the charter school but having heard the testimony of the parents, students and teachers from her mother's school was torn about what should be done. There was some excellent statements from the public. Monica Ayuso was great. Unfortunately, there were few people left when we finally got to the Panel discussion and vote. With regard to charter schools and co-locations, I argued that it was clear from the night's comments and from the Chancellor's extensive correspondence with Eva Moskowitz that decisions about schools were being made by the Chancellor, his senior staff and charter operators without input from or consultation with the community. Klein and I had some back and forth until Chairman Chang cut off the debate. All the votes on the above schools as well as the co-location of Democracy Prep in Manhattan's PS 92 passed with 9 "yes" and with 3 "no" votes or abstentions. There was a bitter debate from public commenters over Eagle Academy. Members of the IS 59 community complained about the lack of consultation and about how the do-over vote was rescheduled at the last minute. Queens, having obtained significant concessions on the co-location, supported the proposal. Manhattan and Brooklyn abstained. I asked about the use of Title II funds for training non-public school leaders and Kathleen Grimm assured me they had no prerogative to spend the money otherwise, that it was a required pass through. I complained about the lack of process and disclosure for the bus contracts. Bus contacts passed with my one vote against, all other contracts were passed unanimously. I was downstairs when I heard what Yelena describes here. John Yanno's resolution, followed by Leroy Barr's scare tactic (Fiorillo often says that in most unions it is the boss who uses scare tactics but in the UFT it is the union leadership), the voting down of Yanno's resolution overwhelmingly, followed by Altomare's description of the early days of the union and the guts it took to build it. I thought I was hearing Altomare supporting Yanno. 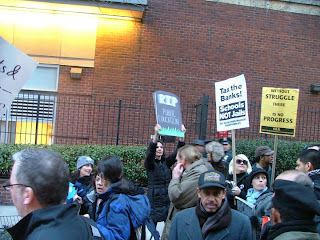 But it was a different resolution- to celebrate the 50th anniversary of the UFT. And it passed overwhelmingly. Yelena came out spitting fire at the outrageous contradiction. Here is the result. On my father's first day on the job he was on strike. It was September 1966, he had three young children and a wife who wasn't working. He had a mortgage, no car, and he never went on vacation. He was a New York City public high school teacher and it was because of him, and others like him, that the UFT has gained many of the rights and benefits that teachers have today. During the new motion period at the March 24 UFT Delegate Assembly, John Yanno proposed a motion for next month's agenda to mobilize the membership for our current contract fight. He included the dreaded words," job actions" in his resolution. Leroy Barr, UFT Staff Director, immediately jumped up to oppose it (as he usually does for any type of mobilization such as a rally) because he claimed that if we chose to engage in a job action, which he intentionally interpreted to mean a strike (there are other types of job actions), we could lose the contract we already have. Those present overwhelmingly voted with Leroy to defeat the motion. Immediately after the motion was defeated, one of the UFT's founding fathers, George Altomare, rose to motivate a resolution celebrating the 50th anniversary of the UFT. 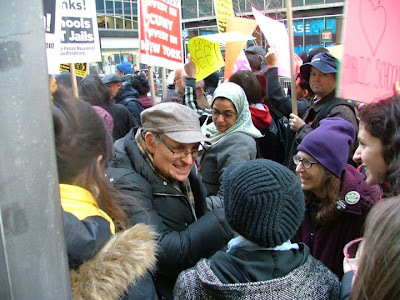 He spoke of the courage it took for him and Abe Levine, and many other early UFT members to go out on strike all those years ago when they could have all been fired; how conditions were worse than they are today. Maybe he didn't know my father, but by unanimously passing the resolution to celebrate the UFT's 50th anniversary, our assembly honored him as well as George and the other early members. Did no one in the Delegate Assembly notice the hypocrisy of these two actions just minutes apart? While applauding the courage of our predecessors the Unity dominated DA clearly chose not to follow in their footsteps. Does Michael Mulgrew encourage those he leads to be unquestioning followers devoid of any passion or courage? Earlier in our meeting he tried to rally those present to fight the education cuts that the New York State legislators are planning. I guess our group is able to do things like make a phone call, fax our senators, and meet with them cooperatively. Just don't ask us to do anything too strenuous, anything that takes too much guts. That's pretty much reserved for a bygone time that we can romanticize about and drink cocktails over as we celebrate the hard work of those who are not us and will never be unless there are drastic changes to the thinking of our leadership. Yelena Siwinski is running for Vice President of the Elementary Schools on the ICE-TJC slate. John Yanno is running for Executive Board at-large. (1) On February, a Daily News reporter asked you about the UFT charter school’s practice of enrolling lower percentages of ELL and IEP students than the neighborhood schools. You told her, “That’s why we recommended the [Charter] law, because we know we aren’t serving the neediest students.” (New York Daily News, 02-24-10) Why does the UFT need a law to force it to serve the neediest students? (2) Earlier this month when New York was named a finalist in the competition for Race to the Top grants you praised the state’s application for its “dedication to innovation, improving teaching and learning, curriculum and the issues that really make a difference inside the classroom.” You didn’t offer a single word of qualification with regard to the application’s commitment to wholesale school closings and linking teaching evaluations to test scores. Did you actually read the application? Lawhead is a candidate on the ICE-TJC slate for HS Executive Board. Vote ICE-TJC and out him on the Exec. Bd. so he can ask Mulgrew questions like these regularly. •To building strong alliances between teachers and parents and students at the school level. •To a democratically run union where power emanates from the schools and chapters, not from a narrow top down decision making body. •To organizing teachers at the chapter level so they feel they have real power to influence union policy instead of being asked to follow a pre set line dictated from the top. 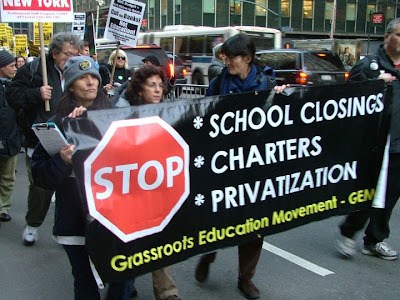 •To a massive fight back in every school that has a charter inserted like a growing cancer– including the UFT charters – so the UFT can take a stand against the privatization of the public schools. So the next time Unity or New Action slander ICE as the party of NO, think of all these YESES. Unity (with New Action’s support) are the ones who have said NO to these reforms. The ICE-TJC candidates are amongst the most progressive teachers in the system. People who have been for the kinds of reforms that will make the NYC schools work for teachers, students and parents. They are writers and thinkers and fighters for change. There are 3 days left to get ICE-TJC leaflets into your school. Don’t let Unity be the only voice heard. It's nice to be king. Unity Caucus owns the NY Teacher. All caucuses get to put a two page ad in two consecutive issues of the paper. We were told we had to have a camera ready ad in by Feb. 22. But Unity gets a second chance to answer the ICE-TJC ads in the current edition. 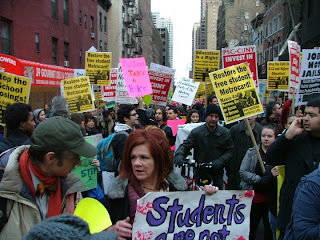 We would protest - if we thought anyone actually reads the NY Teacher. On another affront. Unity district reps feel free to go into any school with an ICE or TJC chapter leader and stuff mailboxes with Unity/Mulgrew material during the school day on union time. When we call Michael Mendel to complain about schools that do not let us in during the day, Michael always comes through - except that he tells us he can only guarantee us entry before or after school days. Since Unity sends out packages to every chapter leader to stuff mail boxes, it is fun to observe the UFT's increasingly narrow interpretation of our rights. The union FINALLY sent out a letter to schools affirming the right to place materials in mail boxes- people began receiving them in the last few days. But the letter was dated March 8. That US postal services is sooooo slow, you know. Most principals don't seem to care one way or another. But Unity chapter leaders often take umbrage with the whining, "You should have had the courtesy to inform me you were coming." Sure I told one. I hit 20 or 30 schools a day and don't exactly have time to call you with a heads up. He actually turned out to be a nice guy, though he was quaking in front of his principal, who had insisted he be present while I stuffed the boxes, even sending up a teacher to cover his class. I was astounded when he told me he doesn't put even union material in the boxes without asking the principal. This is the party in power yet. Last week I made an appearance at an elementary school where one of our 5 year activist teachers work. Having them work with us and build strong chapters has been the best part of this campaign. But I will point out that both work in schools where teachers feel they have a strong voice and are happy with their principals. They put in a lot of hours very willingly and that is an issue that we have to address at some point. One of the high school teachers, who had left a large high school with an awful principal 5 years ago, was pregnant and I wonder how things will shake out for her when she has to head home after school to see her baby. After the meeting I went to CUNY to join the GEM meeting where Puerto Rico teacher union (FMPR) president was the guest speaker. The meeting attracted about 50 people. Afterwards about 20 of us went out to eat. The response to the election has been much higher than expected, though I don't know if that translates into votes. I finished working on our main leaflet less than two weeks ago, the day before ballots went out. We printed an initial run of 20,000 and by the end of the weekend most of them were out of my hands. Almost every day last week I had to order another box. We are up to 40,000 and that isn't counting the number of people who went out and printed their own copies. Since we are only distributing for 10 days ending this Friday, that seems pretty amazing, compared to previous years. But again, I don't think all these leaflets necessarily translates into votes. In the last election I can't tell you how many people said they voted ICE-TJC but the totals were far below one would have thought. My guess is that people fill out their ballot and just forget to mail it. And then there were those 2 thousand invalid ballots. That was why we focused on getting people to vote correctly (Unity copied us in their latest ad) and also to remind them to send in their ballots. If you are an ICE-TJC supporter don't just accept it when people tell you they voted for us. Make sure they send in their ballots. Unity chapter leaders are actually holding raffles for people who bring in their ballot to be mailed. Not wanting people to forget who hand-picked Mulgrew, the winners get a print of the famous Klein-Randi (Remember her?) 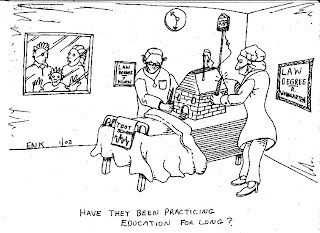 cartoon in Ed Notes. 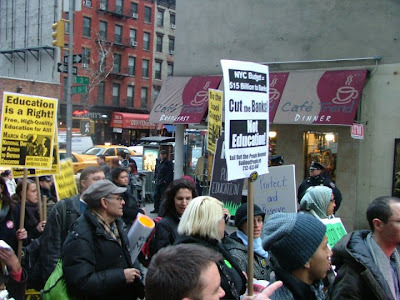 Related: See the ICE blog for a take on the UFT ad. NOTE: I have not been doing much analysis on the election and what it means but will do a lot more next week and after the results are announced on April 7. As usual, this guy is facing the wrong way. Where was Unity Caucus and New Action? Missing inaction. Two mainstream opposition parties, considered to be under Kremlin control, did not take part. Clearly, Putin has gone the Unity Caucus policy of having its very own opposition party as a pet one better by owning TWO opposition parties. Maybe New Action should split - call one NEW and the other ACTION. Then they can run two slates that endorse Mulgrew. Just as they endorsed Weingarten for president. Twice. Now explain again exactly where they oppose Unity policies? Meredith and an investigative team at Daily News untangle the tangled web that is the Peninsula Prep charter school story. Still some unanswered questions. One: what political deal was behind the city’s promise to donate $31 million to build a facility for this charter school, considering its shaky history? Two: if private developers realize that providing schools give them an advantage in selling properties, why doesn’t the city recognize the economic value of building more public schools to sustain and strengthen the city’s economic future? Peninsula Preparatory Academy Charter School in Averne By The Sea, Far Rockaway. "We should really have the building that was promised to us," Principal Ericka Wala said last week. "That's why they moved here." Its "gym" is a room inside a trailer with bars on the windows; the space doubles as an auditorium and cafeteria. Yet it's barely big enough to serve even a single purpose. At a recent schoolwide parent meeting, the 150 grownups who showed up couldn't fit inside. One linoleum floor is split down the middle, and the sidewalk outside the entrance is so narrow, students must press against the fence to avoid cars on the busy road. "It's not good for the children," said Modupe Lawal, the mother of 6-year-old first-grader Tolulope. "When you're in kindergarten, first grade, you need that experience. You need to go outside." Officials at Peninsula - once housed comfortably inside Middle School 53 - say they moved "due to increased enrollment." Wala said there were "issues" about placing elementary school students inside a building with middle-schoolers. In a statement, the Department of Education said the school "opted to move out of the building and asked for temporary space," which was donated by the Benjamin Companies partnership. The department said questions "regarding the rationale for the move are best directed to the school itself." Peninsula officials did not answer a long list of written questions from the Daily News. But The News found there may be another reason for the move. Benjamin Companies' employees and several affiliates have contributed $144,500 to Smith's campaign and political action committee, Build New York PAC, since 2002, records show. The Benjamin Companies is a major builder of affordable housing projects operated by Smith's former boss and political mentor, the Rev. Floyd Flake. And the relationship doesn't end there. A member of Peninsula's board in 2004 and 2005 is a real estate broker whose clients include the Benjamin Companies' partnership developing the Far Rockaway site. The FBI has seized documents in an ongoing probe of nonprofits tied to Flake, Smith and U.S. Rep. Gregory Meeks, who was also a Peninsula board member through 2008. Peninsula is a nonprofit, though it's not clear if the school is part of the probe. Smith founded Peninsula in 2004 and served on its board through 2006, when he claims he cut ties with the school after becoming Senate president. Yet the DOE recently noted "the school continues to publicize" its links to Smith and Meeks, and this year Smith sponsored a $100,000 legislative "member item" for Peninsula. Smith said Friday he had no role in selecting the trailer site and that the contributions played no role in that selection. "They're like any other contributions to the senator or his PAC from people who value his leadership and vision for the state," said Smith's spokesman, Austin Shafran. In October 2004, Smith joined Flake, a Meek staffer, schools Chancellor Joel Klein and other officials to proudly tout the opening of Peninsula. The charter school had just opened in MS 53 with plenty of space, a gym, a cafeteria, a playground and a new science lab officials said was built for Peninsula. By September 2008, Peninsula and its 300 grammar-school students were transplanted into two trailers crammed into a tiny vacant lot and hemmed in by a chain-link fence. The trailers sit amid a large construction site with mounds of dirt all around, across the street from where the new Peninsula Charter School is supposed to be built. A January 2009 Department of Education report found "sufficient classroom and office space" but noted students studying at a large table that blocked the rear exit of one trailer. DOE "report cards" - an "F" in 2007 and a "C" in 2008 and 2009, putting it in the bottom 1% of elementary schools in New York City. Coralanne Hunte, whose 9-year-old son, Chandler, is in fourth grade, fondly recalled when the school was in MS 53. "They had the opportunity to share the gym; they had an outside area that was really large. [Now] they're missing out on that," she said. "It wasn't clear to me why they left MS 53." There is no target date for the new school to open. The agreement with the city Department of Education stipulates that the city pay 74% of the expected cost of building the school - up to $31 million - and the developer pays 22%, with a grant from the nonprofit Charter School Institute for the difference. The Benjamin partnership bought the land from the city for a reduced amount under an urban renewal program, according to Gerard Romski, project manager. The city could not provide the purchase amount. Though sources say the new school likely will not open before 2014, it appears Peninsula has already spent $559,211 in taxpayer money for "construction in progress." Romski says the building is in the "design phase." Nevertheless, the "new school" is a top selling point in advertisements for housing at what the developer calls Arverne by the Sea. So far, about 850 of an expected 2,300 units have been built and all have been sold, Romski said. Victory Schools, a for-profit company, manages the school for a fee of 18% of what the school brings in per student from taxpayers. Last year, that amounted to $866,485. Victory's founder, Steven Klinsky, donated $12,000 to Smith in 2006-2007. An April 2008 DOE review found "a continued and growing negative net balance" that "poses a threat to school's stability." Peninsula officials say in reports filed with the DOE that the school is solvent. Remember that Randi Weingarten called the Detroit teachers contract, branded as the worst in AFT history by many, a good one. Maybe just a drop in the bucket of the UFT dominated AFT, but this message from Detroit's Steve Conn is an early warning sign for Randi Weingarten and the AFT that their collaborationist policies are causing a counter reaction. Now let's understand this: In the current UFT elections, Unity will win 750-800 delegates to the AFT convention in Seattle, July 2-4 this summer. Check your ballot to see if your chapter leader is on the list and you will get an idea of why you are seeing Mulgrew literature flooding your mailboxes. This is not something Unity people like to talk about in their schools. That you are paying for their little junket. But Steve Conn and a merry band of delegates will be there to greet them. 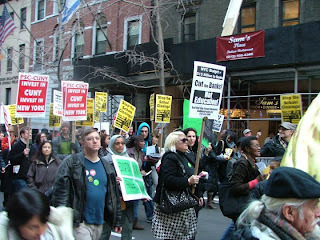 Steve and I have spoken and he wants the dissident NYC crew to join them to make a statement. If we go it will be just like the DA - maybe we can bring back video of all your favorite Unity Caucus members eating, drinking and partying ala the famous wine and cheese party used to try and scuttle the ATR rally a year and a half ago. For those who think Mulgrew is not Randi, watch his votes in Seattle this summer. I guarantee 100% agreement with Randi. As will all the other 800 Unity Caucus revelers. A group of Detroit teachers who vigorously campaigned against the recent contract that their union negotiated with DPS Financial Manager Rob Bobb have swept all 20 positions in union elections held this week for delegates to their union’s national convention scheduled for this summer in Seattle. “With this vote, teachers in the schools have spoken loudly and clearly that they want a sharp change in union policy at the national level and an aggressive defense of public education against the charter schools and privatization plans of US Secretary of Education Arne Duncan,” said Cass Tech teacher and long-time activist Steve Conn, whose 1507 votes placed him first in a field of 63 candidates. The teachers group, known as Defend Public Education / Save Our Students, last week got the Detroit Federation of Teachers to begin mobilizing for the April 10th National March to Defend Public Education, in Washington DC. Buses will leave from the DFT headquarters on West Grand Blvd. Friday night, April 9th. The Defend Public Education group also plans to help lead DPS union in a march this Tuesday from the DFT Building to Rob Bobb’s headquarters at the Detroit New Center‘s Fisher Building in order to stop Bobb’s plans for massive school closings, layoffs, and union concessions. From the Fisher Building, they will march down Woodward Ave. to join cityworkers protesting Dave Bing’s Sate of the City Address at Orchestra Hall. The group opposes a mayoral takeover of DPS,pointing out how much damage was done to the city’s schools by the 1999-2004 state / mayoral takeover. Are Charter School Operators Klingons? NY1 Ad for Harlem Success Academy this morning!